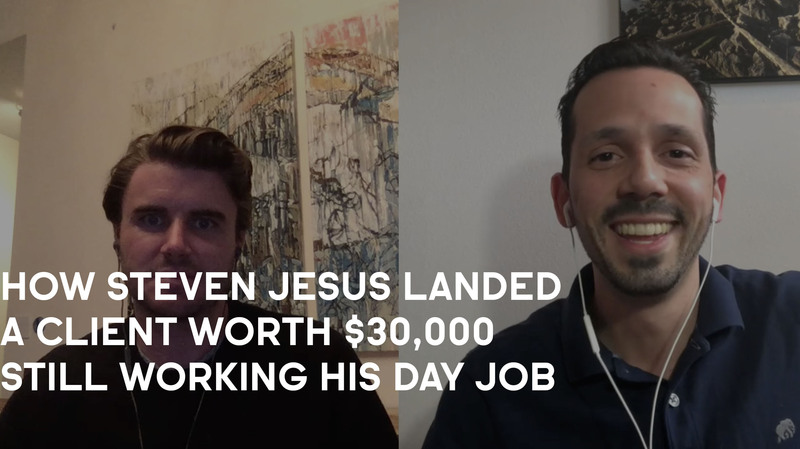 How Steven Jesus Landed A Client Worth $30,000 Still Working His Day Job. Niche: Helping dentists get more clients with machine learning. 1. What happiness means for Steven in his life. 2. How Steven applied his scientific background to marketing. 3. What machine learning is and how it works with digital marketing. 4. How Steven landed his first client. 5. Steven’s solution for when a prospect asks you for testimonials. 6. Steven’s struggle with “imposter syndrome” coming from the academic world. Sam Ovens:	Hey everyone. It's Sam Ovens here, and today I've got Steven D Jesus, and Steven helps chiro and dental businesses get more clients with machine learning, which sounds really interesting. I'm looking forward to learning about that. Steven's a scientist. He still is a scientist, and he still has his day job and he's still doing that. He joined the Consulting Accelerator program about a year ago to start his own business. Since then, he's been able to get one paying client on a 12 month contract. Congrats on that. This is an earlier stage discussion. You haven't quit your job. You haven't got to six figures or seven. You've still broken a huge milestone. For a lot of people who are watching, I'm sure, they've got their day jobs and they're thinking about starting a business and getting a client. This will be a good discussion. I'm looking forward to chatting with you and seeing how all of this came about. Steven Jesus:	Thank you for having me, Sam. I look forward too. Sam Ovens:	Cool. Before you joined, you were a scientist at your day job. What even got you interested in starting your own consulting business? Why not just be a scientist? Steven Jesus:	I do love science. I love what I do. I think my passion actually to start a consulting business started with you, actually, the first time I heard about you. I would say that I did join your program about a year ago, and before that I'd been having these thoughts of I wanted to do something else. I wasn't fully happy in the job that I had, and I had been feeling that way for a while, I would actually say about a few years ago. I've been telling my fiance at the time that, "I'm not happy here. I want to do something." I started essentially thinking about all the things I could do. Always the idea of having my own business was very, very appealing to me, but I was probably like most other people in the world, like, "I probably have nothing to offer to people, nothing that people would actually pay me for, and I don't know anything about businesses either." I was on that mindset, and for some reason I heard about Tai Lopez. I saw an ad on Facebook. I decided, "Let me just follow this guy and see what he does." One day he actually was promoting I think it was a webinar of yours. He was saying, "I know this guy, Sam Ovens. He's a great guy. He's teaching people how to start their consulting business." I was like, "Oh, maybe I'm going to get on this webinar and see what he has to say." I was in that stage of I have zero knowledge about business, so I'm just trying to explore everything. I was getting on every Live video that I could get into for free and just trying to learn and see if I could find any viable path for me. I went through your website and when you talked about consulting and what consulting really is, it was like an eyeopener for me, because I come from an academic world. I went to college, I went to graduate school, and I had this vision of what people in the academic world consider consulting to be like, which is charging per hour, all these things. The way you explained it just sounded so much more appealing to me. It was almost like this is exactly what I've been looking for. I just didn't know how to form it in thoughts, but you explained it in such a way that I could actually visualize it now. It was clearer for me for the first time. At the end of your webinar you talked about the Consulting Accelerator and I was like, "I need to get on this program." That's how I heard about consulting for the first time. When I joined the program I still didn't know what I wanted to do, what my skills were or anything like that, but I knew that that could be an option for me, and I was feeling so stuck in my life that I was like, "I need to try this." That's how I ended up in the consulting path. Sam Ovens:	You said you were feeling stuck in your life, you wanted a change. What does that mean? What was going on? Steven Jesus:	I guess for most people in the world, I do have a good career. I have a good job and I have the potential to have a job that could pay me six figures with the degrees I have and all that. However, for me happiness is not just about the money. I need to be happy with what I'm doing, and I think that right now the way, and this is just very specific to how the science world operates, it is really very low pay, a lot of working hours, and there's not a lot of appreciation to what you do either. We do things that I consider personally very, very important, helping advance different therapies for many people with many devastating medical conditions. It's something very important. I wasn't happy. I wasn't feeling appreciated. I wasn't feeling like I actually get paid enough for the work I do, for the hours I put in, and it's something that gets quickly dismissed when you talk to any manager about maybe I deserve a raise or something like that. I think on that sense I had not been feeling satisfied and happy in life. I've always wanted to have more success than this. I've always known internally that I'm smart, that I can do so much more better, I just didn't know how to. I think that, again, when I attended that webinar of yours it just shed some more light into all the things that I can actually do and don't even require the degrees that I have. Sam Ovens:	So, kind of like unleashing your capability. Steven Jesus:	Yeah. It turned into something where every single day of my life I would think about it. I would wake up in the morning, I would go to work, and I would enjoy what I was doing, but I wasn't loving it anymore. Every single day I would think, "Oh my God, I could be doing something else where maybe I could be having a bigger impact in people's lives, and I just don't know how to do it." Those thoughts just kept creeping over my head, and sometimes I, of course, would try to shut them down and say, "It's fine. At least I have a secure paycheck." A lot of people think that way. Then very quickly like in a week I would start getting frustrated by some other thing, and then these thoughts would come back, like, "Oh my God, if I was just doing something more meaningful for me personally." One day I just got tired. I think your webinar was the last straw. I was like, "I definitely need to do something. I feel like this is a sign that I got this guy in front of me, and he has tools and the knowledge to help me accomplish that one thing that I'm seeking, but I haven't been able to crystallize it yet, or actually imagine how it looks like yet." Sam Ovens:	You joined, and then what happened after that? Steven Jesus:	I joined. I went, it took me about five to six week. I tried to dedicate one full week to each week and not rush through it, because I was new to everything, so everything was new to me. I went through the program. I quickly realized that, and I remember in your webinar you mentioned it many, many times, you were like, "This is going to work if you put in the work. You have to do it, and if you do it I promise it's going to work." I didn't realize how hard it was going to be, so I started realizing that I had other problems that I was going to have to overcome and some issues. I always thought that I had a great mindset until I actually tried to start my own business, because I was like, "I went through school, and I went through a PhD and it's in science, which they treat you like crap. It's really, really hard, and I have many, many friends that dropped out. I have persistence. It's okay. I know this is going to be a piece of cake." When I started doing it, I was like, "Wow. I have never faced something like this." This really tested things that I had never experienced before. It took me a while to figure it out. I encountered, like I said, many problems starting with mindset. I didn't know what I was doing at the beginning, so I was like, "What do I do first?" There's a whole array of things that I just thought I have to go through that year, but I went step-by-step and overcoming one right after the other. Sam Ovens:	Was it really that hard compared to getting a PhD in science? I swear I couldn't do that. I was able to do this. Is it really harder or is it just a different hard? Steven Jesus:	I think it's a different hard, because I think going through science and all that and school for me was I think I was a little bit more ... One of the things that I had problems with when I started was just reaching out to people, talking to strangers. These are things that I didn't really have to face when I was in school, when I was in science and things like that. These were the things that for me were really, really tough. Having somebody to tell me like, "Please stop contacting me." Just like that, even if they say it in a polite way, it would make me feel terrible. It was just like, "Oh my God, I'm bothering somebody. I'm making their day worse. I feel like a terrible person." I was like, "I don't want to do this anymore." I think it was just a different type of hard, because in school it's like you're already there and as long as you get good grades and you do your work, you're going to pass. It's just a different type of hard. In business, you have to constantly get better, and better, and better, and you have to identify things. It's different because it really takes a lot of maturity out of you, and you have to be very critical about you, and say, "I'm sucking at this. I need to fix this." And instead of crying and saying, "Why is this happening to me?" You have to think about how can I prevent this from happening again. It's just a different way of seeing life, whereas in school everybody just cries and complains about, "This professor's bothering me," and things like that. Really it's just not ... Sam Ovens:	Also, at school you ... Steven Jesus:	... not the same. Sam Ovens:	... know exactly what to do, because they tell you. You've just got to do it, but I guess in business you've got to figure out what to do and do it. Steven Jesus:	By yourself. Exactly. By yourself. I didn't know that many people. Most of my friends, when I started reading books and stuff I was like ... Even in your training you always say, even Nick posts it in the Facebook group all the time, like, "Surround yourself with people that are on the same mission as yourself." For me that was also a little bit challenging, because most of the people that I was surrounded with at the time were people from the academic world, because that's what I've done pretty much my entire life. These people thought very different than entrepreneurs. They don't see money the same way. They probably see you as a greedy person if you try to say that ... If I explained to my friends, and some of them do feel that way, if I tell them, "I don't feel appreciated. I don't feel like I'm getting paid enough. I have these dreams in life in terms of the lifestyle that I want to have." They'd probably start thinking I'm being greedy, I'm being artificial, things like that, like I'm just thinking about money. It's not like that. It's not the only thing I think of. It's a very different mindset, and so it was very hard for me to- Sam Ovens:	Why is the academic world like that? Steven Jesus:	They just have a lot of beliefs about what ... Hard work for them means something very different to entrepreneurs. I agree. I think that in the business world people see it in a much better way. I think in the academic world it's more about they just want to see you doing something. The problem is that, yes, even if it's something that is really not important, it's just keeping you busy, but it's really not something that is going to have a huge impact in your day or in the goals of the company, they just want to see you doing something. I think that's stupid. I've always thought that's stupid. I've worked in research labs and I used to have my manager come to me, and told me like, "Why aren't you doing that?" I'm like, "What? I already finished it." I found a way to finish it earlier and I would take the protocols and ... They just see you as a lazy person. It's very different. I think from the start even when I got into the business world, I had that mindset of always trying to solve problems and find ways to do things that would take me half the time, and things like that. I felt very, very limited on that area, because you don't really have that flexibility. When you have these types of jobs, you just have to do it that way, and if you question the methods, just forget it. You're going nuts, right? Sam Ovens:	Got it. You came in. You started working through the material, following the steps, working on your mindset and stuff. How did you pick your niche? Steven Jesus:	That's another funny story. I was having a lot of trouble when I went through the program. I did all these exercises and I asked people that knew me what things do you think I'm good at. People gave me a bunch of ideas. I still was having a little bit of trouble. I think one of the main things that I came up with was, not to sound very modest, but I'm a really, really good dancer. I used to be a dance instructor for salsa and other types of dance back at home. I did it for years when I was in college as a part-time job. I was like, "Well, but I feel like that's hard to scale." I put up all these obstacles in my mind, because dance it's more physical. I feel like you really have to be there one-on-one, and it's something that will be a lot more challenging to do as an online business. That was on the top of my list, but then I was like, "I don't really know how I would pull that off." I went through I think on week seven I think it was or something, it was right at the last week of your training you shared the story of how you ended up starting your consulting business. You said, "If you feel like you have no skills that you could profit from." And you gave ideas about how you started in digital marketing. I started just reading about digital marketing. I really didn't know anything about it. I actually got interested. I think one of the main things that got my attention about digital marketing was that it's almost like science. I saw a lot of similarities at least in terms of testing things and things like that. There's a lot of numbers involved and you're sort of breaking things down, like when you're looking at funnels and trying to follow all these metrics and things like that. It really reminded me of what I do in science, which is essentially the same thing, and trying to do something and discover something that nobody else has ever discovered, and I'm trying to look at things from different angles, and that's essentially what marketers do a lot of times. They try to show their story, like when you explain your Facebook ads, and you say, "Try different types of messaging, for example. See which one works." Having that ability to break down your product and be able to pitch it in three, four different ways to see which one works better, that's essentially what we, us in science, what we do. We try to look at things different ways. We try to break things down. We try to figure out what might be happening, and we just have to figure it out. That's it. I saw the similarities, all these tests, things like that. I was like, "Hmm. Maybe this is something I would be interested in trying." That's why I decided to give it a shot. Sam Ovens:	Got it. There's a big light coming in. It might be the sun. Just readjust your screen. Steven Jesus:	It's just sun. There you go. Sam Ovens:	Thanks. Steven Jesus:	Hopefully now it's better. Sam Ovens:	I think it is science. I don't think it's like it. It is it. You're basically using the scientific method to test hypothesis, find cause-effect relationships that get you what you want. That is science, isn't it? Steven Jesus:	Exactly. Yeah. That's exactly. I was like, "Well, this is a skill that at least although I don't have a lot of knowledge in marketing, but I have that skill of trying to break these things into pieces, and you're trying to do all these tests and things like that." It was pretty cool. Sam Ovens:	Got it. What happened next? How did you get to the point now where you're helping dentists with machine learning and stuff? Steven Jesus:	I switched niches two or three times, and I know that that's definitely one of the deadliest things that people can do. At the beginning I was oblivious, and I was just trying many things. I finally landed after three times switching niches, I ended up with dentists. The way I ended up doing machine learning is that, and this is sort of, I'd say, maybe about three, four months. It's pretty recent when I ended up doing machine learning. The reason is that I actually came across, also, a webinar from one of your former students. His name is Josh Harris, and he has a program where he helps for digital marketing. I saw a tool there. He was actually helping people use artificial intelligence and machine learning for some of these things. I saw that as an opportunity, as a tool that will give me a competitive advantage. I had gathered all this knowledge from your program, and I was like, "I know what I want to do." By that point I was like, "I know what I need. I've worked my mindset. I'm ready to go, and I have my niche down." I had actually had a lot of dentists, before that, that had replied to some of my messages, but nobody really wanted to get on the phone. I realized that it was because I didn't really have a very unique product. My message wasn't fully resonating with them. The dental industry at least when it comes to digital marketing, it's pretty saturated. The competition's pretty fierce. At that point I stepped back and I was like, "Okay. I have my niche, but my message is not strong. I need a little bit of a competitive advantage here." I decided to give that a try, the machine learning and artificial intelligence, because I thought that the messaging would be more appealing to them in terms of what it can do. That's how I got my first client, probably about three months after I started with that, and it's been great so far. Sam Ovens:	What do you mean by machine learning and AI? That's kind of like a label. What is the tech? How does it work and why is it better? Steven Jesus:	Essentially they developed this technology that what they can do is that they buy a lot of the data from third-party companies, and then what they found is that there's a lot of companies nowadays that can give what you would call behavioral data to other companies. They can tell you, "We took all these behaviors," because they track people, and so they can tell you your audience is definitely interested in music, or in sport, things like that. However, what they found was a way to attach these behaviors to their identity, and so that's the real advantage, because now instead of you obtaining random behaviors you can say, "Hey, John is actually looking into these things. Amanda is looking into these things." Because now they found a way to actually attach those behaviors to the identity they belong to. This makes it so much more powerful, because now this becomes permanent, and it becomes portable, meaning that you can actually take these people and you can create a manifest, and then you can plug it in on any marketing platform that you really want to and pay a lot less for them, because now you're not using the targeting of the platform. If you go to Google, you don't really have to use their platform or their targeting, you can just say, "Hey, I have this list of people. I'm going to upload it." You create a custom audience, and you just get in front of those people. These people essentially represent what we will call the 3 to 5% of people on any market that are ready to buy now, because they're looking at their behavior, so they know that they're at that point where they're ready to make a purchase. Then they apply machine learning, so one thing you can do is once your client starts getting customers, then you can take some of those customers and feed them back into the system, and then the system can go back in time because it has all their behavior recorded, and so it can see everything that they've done before they became their customer and it learns from that. The algorithm gets smarter, and then it can give an even better prediction of the people that are going to buy. Because now we'd kno- Sam Ovens:	Isn't that what Facebook ads does itself? Steven Jesus:	Yeah. That's essentially what they do, and that's very similar to the lookalike audiences, too, like if you upload a list of not clients but customers, then they use their lookalike and do that. We does what they do- Sam Ovens:	Facebook's the largest website and collector of information probably, and behavioral information in the world. They've got the most people and they can tell by what people do on the internet what they're interested in. Then they use that behavior so that you can target them with lookalikes and things. Then if they buy it comes back around and it optimizes through a feedback loop. Isn't that the same thing, but you've just messaged it differently? Steven Jesus:	No. The difference also is that these are real people. One of the big differences about this is that Facebook also has a lot of bots and stuff, so when you advertise, things like that. The way they track people is that bots ... They track people when people do a purchasing, like a purchase action on the internet, or they log in, for example, to the website. That way they make sure that the people that you're getting are real people. They're excluding all bots, all of that. Then the cool thing about that is exactly what you mentioned is that when you take this list of people and then you upload them into Facebook, and then you can do an even more powerful lookalike audience, because now Facebook immediately is going to recognize that these people are in the market right now searching. Then they're going to their customer database, and then theirs start matching even more, so you expand even better. It's definitely more powerful. Like I said, I'm with my first client. However, they've tried this in many other industries and the results at least that I've seen are pretty freaking good. They've gotten 50% reductions in the cost per clicks and acquisition. It's pretty nice. Then the other good thing is that because it's portable, Facebook is just one example, but really this can be plugged into any advertising platform like Google, any display advertisement, anything. You can always get the cheapest costs wherever they are. If one platform raises their costs, you can just go to the other one. It just gives you more flexibility to give your client always the lowest price. That way they're not going to feel like they're stuck with one, if somehow they decide to raise their prices or things like that, which they do it all the time. It's pretty cool. Sam Ovens:	Got it. Cool. How did you get that first client? Did you use direct outreach? How did that happen? Steven Jesus:	I've been doing organic outreach all this time, and so I did it through LinkedIn. Well, actually email, but I have been adding ... There's a lot of dentists in LinkedIn. It's pretty easy to find them. I add them on LinkedIn. I generally send them a thank you message for connecting. I do follow-up with another message, which is generally not that effective. Then what I do is that I export all my contacts from LinkedIn and then I get their email address, and then I actually send them cold emails. The nice thing about it is that at least I have that warm introduction, because I can say, "Hey, we connected on LinkedIn a while back. This is why I am messaging you." They're not necessarily like, "Where'd you get my email? Why are you emailing me?" They're more responsive that way. I personally have found that not that email's super amazing, but it's definitely a lot better than just writing to them on LinkedIn. Most of my strategy sessions have come from email. Sam Ovens:	Got it. Then how did that process go with that first client? Did you search on LinkedIn and then find them and then add them as a connection, message them? What was the steps in that process? Steven Jesus:	I have already messages. I sent them a message. I put a link to ... I have a landing page and it has a calendar there. I send them the link, and I say, "If you want to learn more, you can schedule a quick call." I put the link, and all they have to do is just click on the link. It takes them to the page. Once they book the appointment, then it takes them to a thank you page. It's a very simple process. Then they get reminders, also, all the way up to the call. Sam Ovens:	Got it. How did you come up with the pricing for your offer? Steven Jesus:	I actually wanted to price a little bit more just because I think that what I can do with this technology offers a lot of unique value for them. I did do 2,500, I think, because it's pretty close to, I guess, what we would call market value. I think that a lot of people would charge somewhere around 1,500 maybe for one. What I'm doing is I'm doing multichannel, so I'm doing Facebook and Google both. I was like, "I think I can get away ..." I think that 2,000 would sound a lot better to them, but I think because I'm giving them this extra thing that nobody else has and this technology, I think I can go maybe $500 more for the first one. It's like trying to think what you mentioned in one of your videos which is try to think about when you price you try to go on the high side but without making it too outrageous. Just make them think that it's on the high side. Before that, I had another strategy session, I still remember, about three days before that one, and I told the prospect 3,500. They didn't get upset, but the first thing they said is like, "Ooh, that's very steep." I thought that maybe I should change the pricing a little bit, especially because I don't have case studies or anything, too. I guess I don't want to go too wild either and sort of meet them halfway. I was like let me go down to 2,500 and see if that works better, and it did. It worked better. It was still hard to close her, because I didn't have testimonials, and she really wanted to see at least one. I think I had to be as persuasive as I have ever been really to be able to close her. Sam Ovens:	That's a good scenario, because I know that a lot of people freak out about this. How did you deal with that situation where your prospective client's asking where are your testimonials, you don't have any testimonials. How did you deal with that? Steven Jesus:	I told her the truth. I told her like, "Listen, this is a new technology. We are trying to introduce it to the dental industry. It's something that nobody else is using." I was honest. I was like, "We have no case studies for the dental industries because we haven't done it. The technology has been tested by our partners in many other industries." I didn't really go a lot into case studies for other industries, because they don't really care about other industries. I just tried to make the point that it's something that has been shown or proven to work on many other industries. I was honest, I said, "I don't have." When I said that, then she said, "Can you at least show me landing pages, just something?" She was very honest on the call. She was like, "Listen, I really like what you do. I really like the way you explained it. I think it sounds really nice." She told me, "I want to work with you, but you need to show me at least one thing." she was like, "You need to show me at least one thing, because I just met you here on this call, and I just want to make sure that at least you've done it before." I was like, "Okay, would it help if I show you at least examples of, let's say, landing pages, things like that?" She was like, "Yeah. Just whatever you have. Just show me something." I was like, "Okay. No problem." We got off the phone. I then quickly contacted my contractor. I was freaking out a little bit, because I could taste it. I was like, "I'm so close to getting this client finally." I had already talked to my contractor, so I already had a guy to go to. I said, "Listen, can you help me here? Do you have one or two landing pages that you've done in the past? Please can you just share them with me so I can tell her, show them to her?" He gave me two. He told me how they converted for his clients. I sent it to her, and she was like, "Okay, then let's do it. They look pretty nice. Let's do it." She was still a little hesitant because she'd never done advertising before either, but she has heard all these stories about digital marketers and probably talked to other colleagues. Maybe they shared with her bad experiences with digital marketers. She was still a little bit hesitant, but she was like, "You know what, I really like what you do. I like the landing pages, and I realize that I have to give somebody the chance at some point, because I really need help with this." That's how I got started. It was tough. It was tough. I really had to battle. I really had to battle. It took a lot of make it until you fake it, essentially. I really ha- Sam Ovens:	You mean fake it till you make it. Steven Jesus:	Sorry. Fake it until you make it. Yes. It really took a lot of that. I really had to be as confident as I have ever been. Sam Ovens:	You got to do that without lying. Steven Jesus:	Exactly. Sam Ovens:	I think some people misconstrue that to mean, "Yeah, we've got 100 clients and they're all billionaires." You know what I mean? Steven Jesus:	Yeah. Sam Ovens:	That's not what you do, but you can fake the confidence in yourself. Steven Jesus:	I had to fake the confidence that what we're doing works, and it can work for you. We don't have case studies right now, so I can't tell you it works amazingly well in the dental industry, but I can tell you that on every other industry that it has been tested and it's worked amazingly well. To me there's no reason that it won't work in yours, because the principle is the same. We're tracking these people and we can get you in front of them before anybody else. I was just like the principle in my opinion would be the same. I believe that this is going to help you. You have the chance. I tried to be as persuasive as I could. I was like, "Listen, you have the chance right now to be one of the early adopters. If you let this go, once we get two or three case studies this is not going to be 2,500 anymore, so it's something worth trying." Sam Ovens:	Got it. Steven Jesus:	I think I explained it clear enough, such as she saw the value, because she was like, "I really like how it sounds." Sam Ovens:	Now, I've got another question. You said you joined Accelerator in January last year. We're now in, what are we, April, almost May this year. That's 16 months. What took you so long to get one client? Steven Jesus:	I had a full year of mental issues, not like I'm going crazy, but mindset. I think that goes back to what I was saying earlier that when I started the program I started to see a lot of other issues that I had that I didn't know I had. I had to try things that I had never had to try before. I think that mindset was the first thing. I had things all the way from imposter syndrome. In my mind because, again, I come from an academic world my entire life, it's all about degrees. It's all about certifications and all these things, and in my mind I couldn't take it out of my mind the fact that because I didn't have an MBA, for example, or any type of degree, in my mind I was like, "Why am I trying to do this? Why would they choose me as a person that is going to help them if I have no qualifications?" It doesn't matter how many times I would go through your videos saying like, "It doesn't really matter. If you can help them, that's all they care about." It was so hard to just take it out of my head. It took me a long time, and so I was terrified of the sales calls. A lot of procrastination. Sometimes I'd be like, "It's fine. I'm just going to take a day of break. Probably like hit that reset button, and tomorrow I'm going to come back strong." Then tomorrow I would tell myself the same thing again. I was just trying to avoid having to do things that made me uncomfortable. That's when I realized this is important to me, I need to try this, and so I started reading books about mindset. I started trying to learn everything I could. I went back to your week two. I went back to those videos. I tried everything I could to reset my brain and understand all these things. There was so many things holding me back. I wouldn't feel worthy. I think at the end of the day overall that's how I was feeling. I wouldn't feel worthy. I was like, "Why would they go with me when there are so many agencies out there that are already established or consultants and people that their business is already out there? They've done this a lot of times. Why would they go with me? What do I have to give them that they can't give them?" Was a lot of scarcity mindset issues too. It took me a long time to really understand that I'm unique, understand what I have to offer, and to really value myself as a person. Not that I thought that I was dirt or anything like that, but just I didn't really think that there was anything special about me that people would actually hire me and pay me to help them. It took me a long time. Also, there's the business aspect. Like I said, I jumped from niche to niche, too, because I just wanted something to work. I was just like, "This is not working, so maybe it's the niche." And then I would switch. Then later on I realized that it was not the niche, it was me. Sometimes when you're starting out, and I think that some other people in the program might relate to this, you don't really know what's right and what's wrong yet, and so you just want to do all the right things. You really don't know when you're doing them if they're right. If you're not seeing an immediate payout for what you're doing, then you just start thinking that it's probably wrong; I need to change it. It's really hard when you're starting at the beginning try to say, "Well, I'm going to do this email campaign. Let me give it 200, 300 emails." Sometimes the first 20 go out and you're like, "Yeah. This is not working. I just want to change it." Then you have to be like, "No. You've got to give it more time. You've got to get more data." At the beginning you're so desperate to start, and I think that that was also playing against me. Then once I fixed all of these mindset issues, then I had another issue, which was, "Well, now I understand how the mind works. I've been working my mindset." But then I was too comfortable. I was actually telling my wife one day that I think the problem I was having is that because the job I have right now I don't make a fortune, but I make enough to have a good living. I think I was too comfortable. At the point where I don't think I was working as smart and hard as I could have, because I was so comfortable that I could be like, "Well, I'm going to finish this tomorrow." Because I know I'm getting paid, so I'm not like, "Oh my God, I'm going to lose my job next month. I need to get this work." I didn't have that mindset yet. That was another thing. That's really when I realized I need to do something about it, because I am never going to get a client. It's been a year, and I'm still here stuck. I tried to do something different, and I told my wife that I was going to start thinking that I was quitting my job in a month. I told my wife that in I think it was around mid March this year. She was like, "Why on earth would you do that?" I was like, "Because I feel that I'm too comfortable. I need to give myself that urgency so I can actually be more focused and more productive." Because to me if I put myself a timeline, a tight deadline then I become more focused. I start doing only the things that matter, and I leave everything else out. If I know that I have a lot of time, then it's like I'm never going to do it. I did that and in less than two weeks I got the strategy session scheduled for the woman that is my client right now. Sam Ovens:	Nice. Steven Jesus:	It was definitely a long road, lots of mindset issues. Some people are able to overcome them a lot earlier than me, but for me it definitely took me a while. I think that this year right now I feel like I am a completely different human being than last year, just the way I talk, the way I think, the way I see things, the way I think about my business. A person like me last year I would have never thought that I can do anything, and so now I do. Now I think that I've got one client, I can get 100 more. I'm ready for it. I'm ready, I'm hungry, and I just feel very, very confident. I'm working really hard for my client because I really want to get that testimonial, because I know that once I get that case study, that testimonial, it's really going to be significantly easier to get more clients. Sam Ovens:	Awesome. I say it's honestly like changing a religion. I haven't done that. I don't know what that's like, but it's like people who are heavily religious and something, and they believe this absolutely is the truth. This is how the whole thing is and everyone else is wrong. I know this is right. Then you've got to turn them over to the other side. That's a very hard thing to do to convert someone. That's kind of what it's like. Steven Jesus:	People don't like to admit when they're wrong, and also for me, like I said, most of my friends were from the academic world. Even my wife at the beginning when I started ... She's always supported me, but at the beginning she wouldn't tell me anything when I told her what I wanted to do with the business, because she felt bad, but she didn't really agree with ... She really didn't want me to start it, because for her she had this mindset that most businesses fail, that it's a huge risk, I have a career. I think over time, I give her a lot of credit, because over time she's learned to see things not necessarily my way, but understand at least my perspective and understand where I'm coming from. Now, we're at a point where she encourages me. She wants me to do it, and she tells me, "If this makes you happy, go for it." At the beginning it was sort of like ... Because she had the same mindset as me, and so imagine it took me a long time to change it, but then I was also living with somebody that had that same mindset. When I started talking differently, it freaked her out a little bit. She thought that I was going a little crazy. She was like, "You're going to quit your job tomorrow, right?" I'm like, "No. Relax. I'm not going to do that." I do want to stop working there, but I'm going to work up to a point. We made that agreement where I essentially have to equal my salary now at least or make a little bit more, and then do that for two months, two to three months in a row, so it gives her peace of mind that I'm actually generating that consistently, and then she will be okay. We'd sort of got to that happy medium. She's happy with it. She's excited that I got the first client, and she even tries to keep me accountable. After my strategy session, she's like, "Did you close her? What are you going to do to get your next one?" It's nice. At the beginning it was tough, because you're living with that person, every financial decision you make is also going to affect her. I had that in my mind, too, like I had to think that whatever decision I make is also going to affect her, so I didn't want to be selfish. Obviously I wanted to do something that made me happy, and I knew that I had to do this. Between mindset, between that, it was a lot of things that I had. It was a long road that I had to go through to get to this point. Sam Ovens:	Got it. Having gone through the program and gone from the start point to now where you've got one client on a 12 month contract, what's been the most transformative part of the program? Steven Jesus:	I would say mindset for me. Like I said, I'm pretty much a different person. If you had this conversation with me last year, it would have not been like this. The biggest thing about the program to me is that it opened my eyes to a different world full of possibilities that I never thought I could have. All the business stuff is really nice, starting the consulting business, but to me what is really powerful about it is that part. You really taught me that I can be more than what I was. To me that's better than anything, because it's like Inception. Once I got that idea, and once I understood that concept, everything changes. I'm a different person. All this year, even if it's taken me a year, it's taken me a year to become the person I want to be, so it's worth it. It's just worth it, and I would have never gotten to that point if it wasn't for Consulting Accelerator. Sam Ovens:	Awesome. What would your number one piece of advice be for other members who are ... I'm sure you've seen them in the community, and seen what they struggle with and things like that. What's your advice for them? Steven Jesus:	My advice for them would be to have persistence. I would say that to me persistence is one of the main things, because it's easy to quit. It's so easy to quit. It's so easy. I think that sometimes I see it on comments that people post and stuff, and I ask myself the same thing. I would ask myself every single day when I was starting, "Some of these are people just getting clients two weeks into the program, and I've been for months and I haven't." I would just tell people especially people that are in a very similar situation and that can familiarize with what I'm saying is just be persistent, and it's not a competition. It's a marathon, so just go at your pace. Everybody arrives to the program at different levels, different stages in life. If you arrive to the program like me where you knew anything about business, nothing about really what you were good at, just have persistence and just learn. Just learn every single day. Focus on the journey, on being better every single day, because it's going to happen. It's just a matter of when. The universe decides, you don't decide. All we can do is just fall and get back up. Just fall, get back up, and the program does work. It's just that sometimes we might have that false expectation that I'm just going to get a client in two weeks, which is totally doable. For a person like me it was impossible. I knew nothing. My mindset was crazy. It wasn't going to happen. I had to become somebody different. I had to improve in a lot of aspects in my life. Don't be discouraged. Just have persistence and focus on learning. Every single day learn something that will take you closer to where you want to be. Sam Ovens:	Good. That's good advice. Awesome. Thanks a lot for jumping on and sharing your story. I'm sure it's going to be inspire a lot of people to either start their own consulting businesses. Hopefully it's going to inspire a lot of people to quit their jobs, and you've got to quit your job soon, by the way, if you want to be a good example. Also, it's probably going to inspire a lot of members in the consulting community as well. Thanks a lot for jumping on and sharing it. Steven Jesus:	Thank you so much for inviting me, Sam. It's my pleasure. Sam Ovens:	Awesome. I'll see you later. Steven Jesus:	See you later, Sam.